For the second year, I’m participating in the YWCA’s Men Who Cook fundraiser. This benefit raises money to help carry out the mission and programs of our local YWCA. This year my table of eight will eat a themed dinner of regional French cooking. French cooking is often characterized as fancy, or haute and many feel that the food is unapproachable. To a certain extent the French do push the limits of cuisine; they have long tradition of fine dining and eating well. But in putting together my menu for the dinner, I found it interesting that many of our favorite American dishes have roots in the French style. French food in its most common form is really based on fresh, locally sourced ingredients and you will find the food that defines a region in France to be made of the food that is grown in that region. We can learn a lot from the French about eating locally. My dessert for this year’s event is Creme Brulee. Translated as ‘Burnt Cream’ its a relative to the creme caramel which is found all over France. 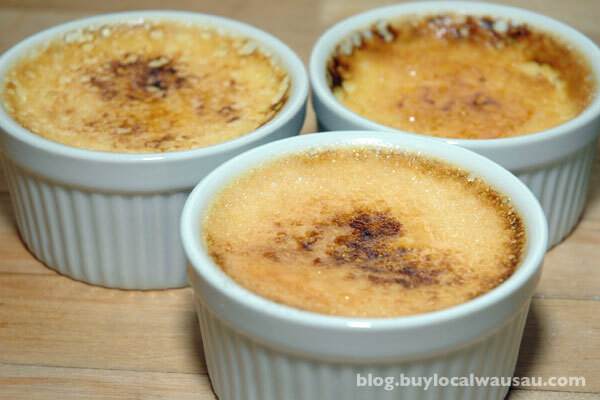 Creme Brulee is a thick, rich custard with a carmelized burnt sugar top. 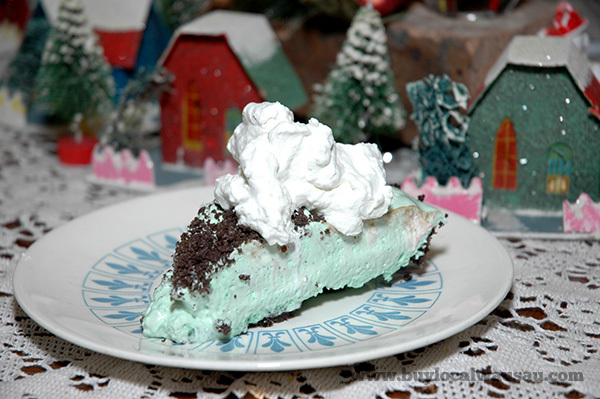 It’s classic, elegant dish and a great ending to a fine meal. Recipe follows after the break. There are a lot of Creme Brulee recipes out their with all different proportions of egg to cream. Julia Child, in her cook books recommends the proper ratio of 1 egg yolk per half cup of cream. Stay with that and your creme brulee won’t have that ‘eggy’ taste. Preheat oven to 325 degrees. Have ready four 3/4 cup ceramic ramekins or pyrex custard cups and a shallow baking dish just large enough to hold the ramekins. In a bowl, with a whisk beat the eggs and vanilla until light in color, about 2 minutes. In a saucepan over medium heat, warm the cream and sugar until bubbles form around the edge of the pan. Stirring so the cream does not scald, about 3-4 minutes. Whisk the eggs while slowly adding the warm cream. Do not add the hot cream too fast to the eggs otherwise the temperature will cause them to cook. The process of adding hot liquid to cold eggs is called tempering. Fill the ramekins with custard mixture. Place into baking pan and fill with boiling water until the water level reaches halfway to the sides of the dishes. Bake until the custard sets, about 35-40 minutes. When done, the custard should jiggle and a skin formed on the top. Remove from the oven and allow to cool slightly. The custard will continue to set. Remove from pan and cool on a wire rack. Transfer to a refrigerator for 3-4 hours. To carmelize the top, sprinkle sugar or brown sugar on the surface of the creme brulee. Place the ramekins in a baking dish filled with ice and cold water and broil 2-3 minutes, until the sugar carmelizes. Alternately, use a torch to carmelize the sugar on the top of the creme brulee. So what do we do with the egg whites? How about baking them into meringues. The melt in your mouth goodness is better than marshmallows. With a mixer using the whisk attachment beat the eggs, vanilla, and cream of tartar on the high setting. Slowly add the sugar until firm peaks appear. Do not over beat. Place meringues dollops on baking sheet covered with parchment paper. Cook for one hour or more, depending on size until crispy.